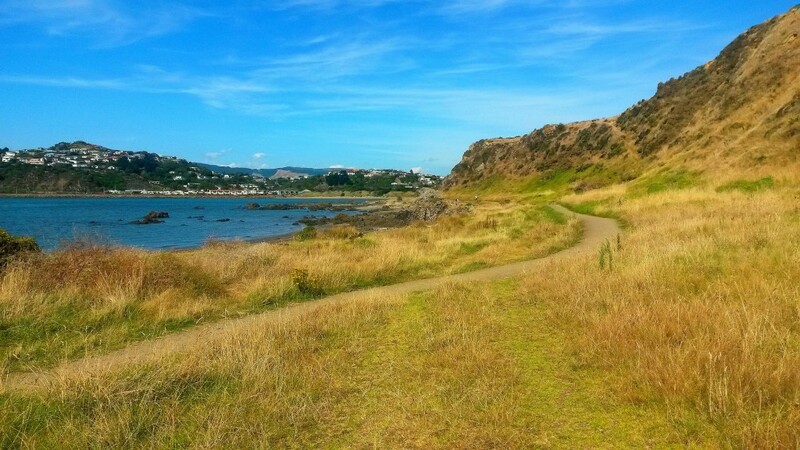 Looking for a coastal walk…this Wellington day walk makes a nice change from the bush walking tracks around Wellington. 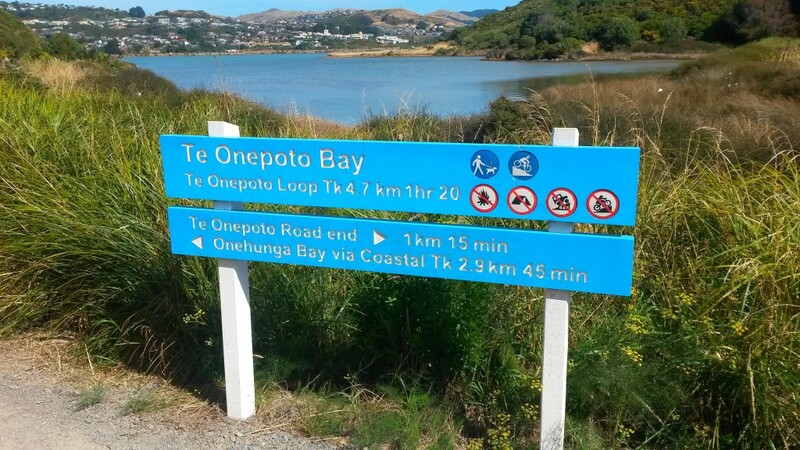 The track starts and finishes at the Onepoto Road carpark and follows the Porirua Harbour coastline to Onehunga Bay…with views across to Plimmerton and Mana Island, this easy 6.7 K walk then climbs a small hill from Onehunga Bay, down through the valley to Te Onepoto Bay and back along the foreshore to the car park. Walking time between 1 hour 20 and 2 hours. This park has significant Maori history…at Onehunga Bay the anchor stone of the legendary Maori explorer Kupe’s canoe can be seen. Kupe left the stone, named Maungaroa, to mark the spot where his canoe beached. Its believed Maungaroa laid in the park for centuries before being moved to Te Papa for safekeeping. When walking through Onehunga Bay look for the replica which was installed by the carpark. To print the above map, click on mapometer at the top of the map. The printing and PDF option at the bottom of this page will print or download the post except the map. Once you’ve clicked on mapometer, the link will take you to the printing or export option. If mapometer asks for your location decline, otherwise it will take you to your location and not the above map. This map also gives great information for getting to the start of the track. If traveling by car from the North or South, turn off State Highway 1 at Porirua and follow Titahi Bay Road to where the road becomes Main Road. Turn right onto Onepoto Road and follow to the end where there is a parking area and toilets. If using Public Transport, take the train to Porirua Station and then catch bus 220 to the bus stop at Onepoto Road. For other walks I recommend taking food and water, however this is a very short walk…a drink bottle is all you’ll need. For more information on what to take walking, check out my blog on hiking gear. Expect some variation in times depending on conditions and personal fitness levels. In the summer tracks are dryer providing much firmer footing than wet muddy winter conditions. A fit walker will be able to walk this much quicker, please provide feed back if this time needs to be extended. 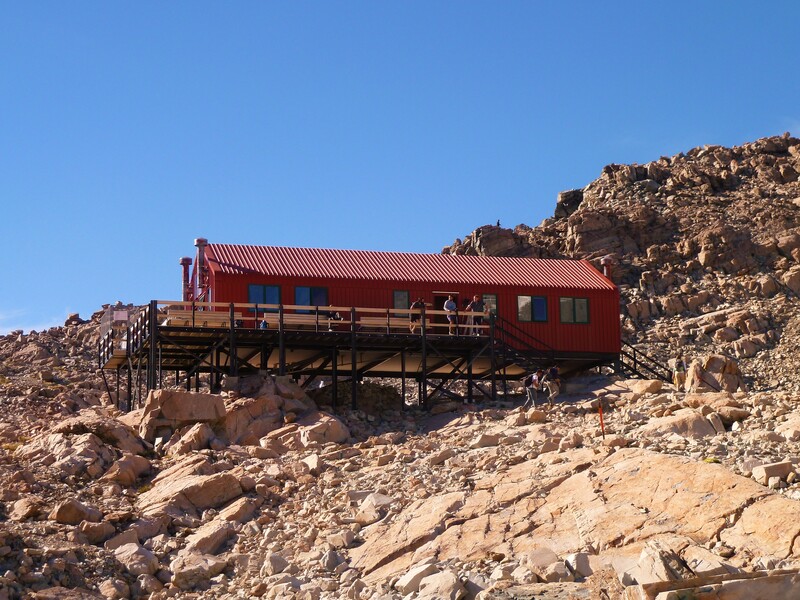 I’ve graded this an easy walk with an average level of fitness required…great for families and kids. This track is well defined and well marked, there are no stream or river crossings and the duration of this walk is less than 2 hours. This looks like a nice walk to take, with beautiful views. Judging by the picture it looks like a relatively easy walk. Are there some hills to climb or is it flat? Also, do they allow bikes on this trail? Good questions, yes there is one hill climb but its very short. When you leave Onehunga Bay there’s a short sharp climb, giving great views…the rest of the walk is flat. People do bike this as well, plus run and walk their dog. Thanks for stopping bye. Couldn’t have came across this post any better. Just about to head to New Zealand and I love to go for walks. The scenery from the pictures looks unreal and 6.67 km would be a nice walk. I will definitely try it out and let you know how it went. Thanks for stopping bye and leaving a message…hope you get the chance to walk this when you’re here. If your traveling to Queenstown, checkout my walk to the Routeburn Falls. This is also a great walk, you will love this one…its a day walk on one of New Zealand’s Great Walks, it’s truly amazing. All the best for your holiday here. Great guide Murray! I love the idea of presenting walks. They’re an underrated aspect of tourism. New Zealand has the most incredible geography I’ve ever seen. I wish I could go there. It’s like the whole world’s climates and terrain gathered on two islands. This walk in particular seems easy and fun for everyone. I don’t know if I’ll ever go to New Zealand, but I’ll be sure bookmark this in my travel section just in case. Thanks for visiting my website and leaving a message…your right New Zealand is a beautiful country, hope you manage to get down here sometime in the future. Take care. Hi Murray. I’ve done a little outdoor walking in my part of the world and the information you’ve presented on this page is the kind of thing I’d like to see more of. You understand how to present useful information in a concise way that means readers don’t have to scroll down endlessly to find out what they need to know. For anyone needing more general information I see you have some useful links to follow. It’s all nicely laid out, and easy to understand. Thank you. Hi. I love this walk. I walk it quite often but didn’t know much about the history of the area – thanks for that information it was very interesting to learn about it. This walk is also a great one to take you dog on. Thanks for visiting my site and leaving a message. Definitely is a great walk, I’ve seen plenty of people walking dogs here too.